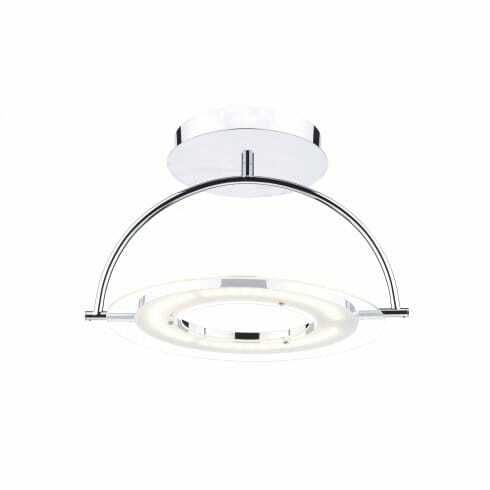 Dar Lighting Atom ceiling fixture features a circular ceiling plate with an oval shaped bracket and a clear ring that houses the integrated LED lamps. This ring can be adjusted to provide multi-directional lighting where you need it most. The product code for this Dar ceiling fitting is ATO1750. The ultra modern look is complimented well by the polished chrome metalwork and the integrated lamps offer bright, long-lasting light without the hassle of periodically replacing the lamps. The matching floor lamp is also available for a co-ordinated look and this can be ordered from our website. To view further LED fixtures and ultra-modern designs, please continue to browse through our ever-expanding online catalogue.